Have you ever heard of the nick jr show called Tickety Toc?? The kid's just love this dvd that is filled with 6 full episodes that any Tickety Toc fan would love. This dvd also includes a paint booklet. I am sure your children will love the episodes bubble time, and help a friend time and so much more. Tommy & Tallulah set out to test McCoggin's new unpoppable bubble formula. When a bubble becomes so big that it engulfs everything in it's path, it's up to helpful Hopperoo to save Tickety Town from a sticky situation! The kids want to keep watching this dvd over and over. 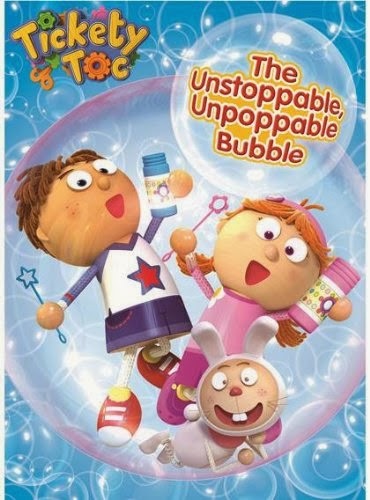 In The Unstoppable, Unpoppable Bubble, our comedic heroes Tommy and Tallulah test McCoggins new unpoppable bubble formula! But soon an unpoppable bubble becomes so large it engulfs the whole town! Will the town be rescued from the extra-large and extra-strong bubble? Will Tommy & Tallulah make it out of the bubble in time to chime? In this and 5 other exciting adventures, the Tickety Town team, along with your own preschoolers, will learn the importance of teamwork, community and social responsibility. Anchor Bay Entertainment is sponsoring a great giveaway where one lucky winner will get a Dvd also just like this one!! Would you like to win a copy for yourself?? Enter the Rafflecopter Below for your chance to win!!! my princess favorite show is mickey mouse. Doc McStuffin is loved in my house.